Celebrate the legacy and heritage of the Medal of Honor with the impressive 2011 Medal of Honor Commemorative Coins. Honor the distinguished men and woman who have so courageously and selflessly gone above and beyond the call of duty. Your coin purchase is a great way to make a difference. 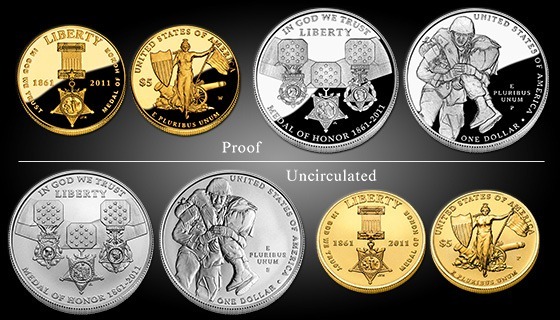 A surcharge from each coin sold is authorized to be paid to the Congressional Medal of Honor Foundation to help finance its education, scholarship and outreach programs. For more information from the US Mint click here. Bring history to life with the 2011 United States Mint Presidential $1 Coin Proof Set! Each stunning coin features incredibly detailed artwork and edge-incused inscriptions. The four-coin set features coins in proof condition honoring Presidents Andrew Johnson, Ulysses S. Grant, Rutherford B. Hayes and James Garfield. The obverse of each coin features a bold portrait of the President and the reverse features a dramatic rendition of the Statue of Liberty. Order now and celebrate our Nation’s rich history. For the past several years we have sold our Coin Vault database software both on EBay and through our website CDP Information Systems. As time permits we will publishing news, information and links for the coin hobby. We will also be publishing a set of EBooks delving into coin issues including the value, mintage, grading, types, and history. Subscribe to our blog and obtain the latest news from around the world.